Despite the fact that the pupusa is an El Salvadorean dish, if I was the head of the Belize Tourism Board, I would make it mandatory that all visitors to the island sample a pupusa on each trip to Ambergris Caye. Perhaps a stamp in your passport to give you a 25% discount on your exit fees at the airport would be in order. This food is that good. (You could get another discount for BBQ chicken with rice and beans and potato salad…but I’ll work on the specifics). My favorites are Chicken and Cheese, Queso Solo or the Pumpkin and Cheese. The last one is DELICIOUS. Pumpkin taste just like zucchini. The dough is formed into a cup and stuffed with your fillings. Hmmm…doesn’t seem that easy to me. It is then topped with a bit more dough and flattened into a fat pancake. Onto the griddle until the cheese starts melting out and starts to get crusty. Serve immediately. DEE-LISH-OUS. 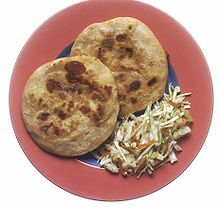 Pupusas are served with a cabbage slaw (I think Waraguma makes the best one) that is just shredded carrots and cabbage with a bit of vinegary-ness. Not too much. It is so tasty and cuts the rich cheesiness a bit. Try it. You also get a bit of a very thin tomato salsa. The most popular flavors at Waraguma are Mixed (pork paste, beans and cheese) and the simple cheese one. Get this…they make up to 500 pupusas on a busy night. Or take them to go. At $2.50bzd each, they are cheap, filling and delicious. If you in any way doubt my loyalty to this local delicacy, meet my male cat, Pupusa. Four years old now, 19lbs and found in a garbage shed in San Pedro at 10 ozs., his favorite is definitely the pork and cheese (hold the cabbage slaw). And if you want to read more about my cats (who doesn’t?? )…here is an older post: Cats Make The Single San Pedro Gal Look Cool. I am embarrassed to say that we have not yet tried the pupusas at Waraguma yet! Probably because we’re rarely in town that late in the day. How many pupusas would you order for a typical dinner? This is a serious research question. I get two…they are very filling. You will want a third but don’t do it! That rookie mistake makes me ruin my pupusa experience. Too funny! I have a large appetite for a relatively small person, so I am sure you’re right. I will follow your sage advice. Thanks! She is absolutely correct Emily! I made the very same rookie mistake and ordered three. Won’t do that again! I’ve never tried the papusas at Waraguma but get them directly across the street instead. One of my very favorite foods!!! Nice post!! I loved the papusas from Waraguma!! Every time I read your blog I tell my hubby I need to remove it from my feed because it’s too depressing. I want to be there, not here!! We ate at Waraguma our last night on Ambergris. We split a burrito and two papusas. I ordered the pumpkin and cheese, but I think maybe our dinner partner may have gotten it. But it was all good! There is a lady originally from El Salvador who sells them on the street in the evening in Caye Caulker. When the wife and I were there for a couple weeks this past Feb we stopped there many times to pick some up for dinner. I like the mixed best. She also had this cinnamon drink that I took a liking too. Apparently we were good for her business. She sells to mostly locals but when we would be hanging out while she made our order the tourists wondering by would come over to look and we’d tell them how awesome they were and then they’d buy some. Towards the end of our stay her sign changed from construction paper to a real nice wooden frame chalk board. My wife and I had a good laugh about how we helped her get the new display with all the business we gave her. Hey, just stumbled across your blog this last week. I have enjoyed it so much. I was so happy to read your post!! We eat pupusa’s at Waraguma’s everytime we are there!! The bartender at Mata Rocks told us about it 2 or 3 years ago. We try to hit it at least a couple of times per trip. Also love Robin’s BBQ which, at least since the last time we were there, is right across the street from Mata Rocks. Robin’s is fantastic. John Harvey is the best. But you must eat pupusas. Punkin Mushroom I will try next.